WINTER. It’s starting to get pretty darn cold outside and just like last year I’ve kind of procrastinated on buying a proper winter jacket, but it’s just so hard finding one that doens’t make me look like a puff pastry. And, if I’m going to be living in it for the next couple of months, it better be one that I really like. Last year I got through winter by wearing my fall coats and lot’s of layers underneath but this year I would love to find a nice, warm winter jacket. So guys, help me out here, if you’ve seen any awesome winter jackets, please share them in the comments below! FAUX FUR PARKA Zara. SWEATER Madewell. JEANS Jbrand. SHOES Sigerson Morrison. 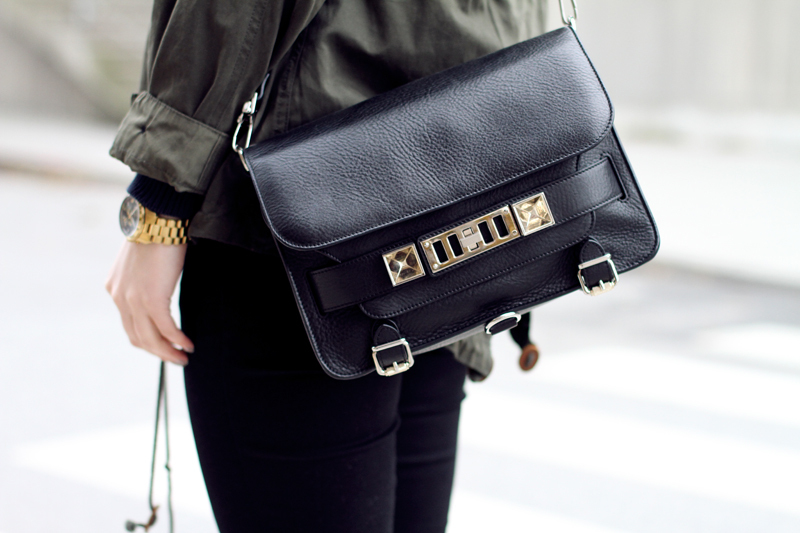 BAG Proenza Schouler. WATCH Michael Kors. This entry was posted in Outfit and tagged j brand, Michael Kors, Outfit, Proenza Schouler by Carolina Engman. Bookmark the permalink. oh I like yours already, but there are definitely ones that will keep you totally warm like canada goose, woolrich or wellensteyn. Lovely pictures, your hair look beautiful. And i really like your boots! Looks lovely! And your gorgous bag give the whole look such an upgrade! the hood on that jacket is amazing! love it! You never fail to look amazing! Love this look and especially that gorgeous bag and shoes. Do stop by my blog, I would love to know what you think about my latest post. That’s a great coat, I love the hood! gorgeous outfit ! PS: Now you can READ my blog also in SPANISH! 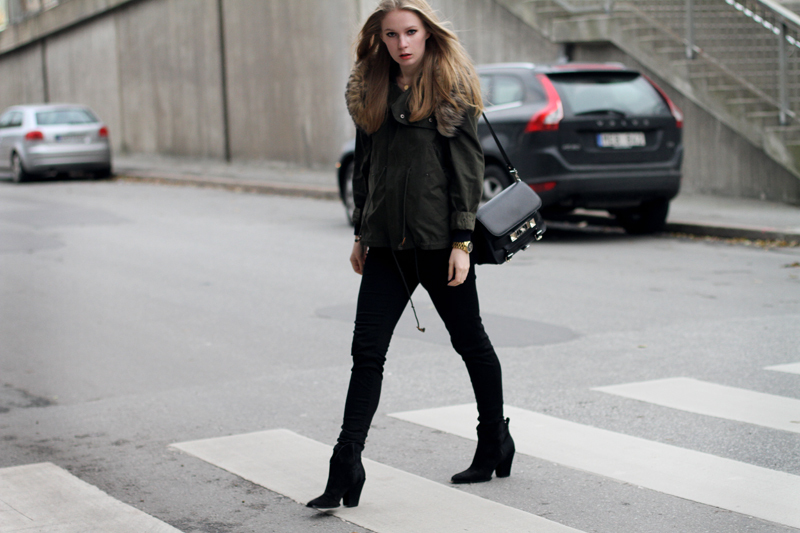 Amazing parka and super cool boots! WOW! Marvellous parka, amazing booties and lovely bag!!!! Such a great outfit! By the way, don’t miss my Worldwide GIVEAWAY where you can WIN a pair of Wayfarer/Aviator RAYBAN sunglasses (you can choose model and color)!!!! You look amazing! I really love this parka! That first picture is amazing! So beautiful. I Love the parka! I’ve been living in mine since Winter decided to hit London early! My Zara parka’s a lil longer than yours and it’s oh so warm and comfy. Love the look you have going! Really perfect parka. Looks freat for cold days. Have a nice day. Love that hoodie, you always seem to have PERFECT HAIR! great PS11! Btw, I recently did a giveaway featuring an authentic Maison Martin Margiela piece, NOT a Margiela for H&M! I love your parka Carolina! But unfortunately I haven’t any advide for you because here in Lucca (Tuscany) is not as cold as where you live… :( Hope you find the right jacket for you! Thats definitely a problem I also do have! Beautiful! And love your boots! You probably find this on Zara’s Swedish website also. It has a good length to not get in the way when sitting in a car, the cut looks well and stylish, it is warm and non-fuss, can be worn to almost everything. For the more elegant times I am at a lack of ideas tbh. amazing look! and great pics! Love the look. Awesome bag. Love how the first photo turned out. It is full of pale colors in background and it looked like it has snowed already. Thumbs up Mattias Swenson! You’re a great photographer. And you’re gorgeous Carolina! I love the parka, have a khaki/green one as well! can you please repost the link of the bag please? You’re so pretty! This faux fur parka is nice! Gorgeous,I love that parka and the beautiful bag! You look amazing! I really love this parka!! Acne has made some really good looking parkas stuffed with feathers this year and they look SO cosy! I bought this amazing Bondelid coat last month at MQ for a pretty good price as it was on sales. 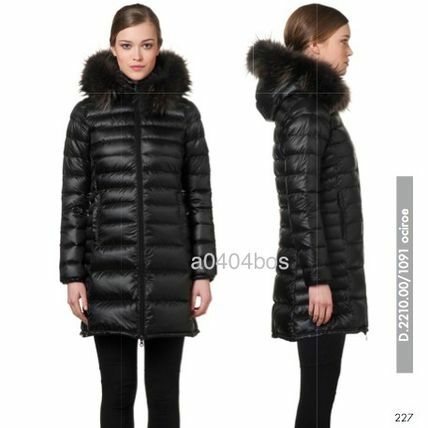 Unfortunately I couldn’t find any link but Bondelid has very nice and warm coats and jackets. I love love LOVE the faux fur trim! It makes it so much cosier! Lovely outfit as always! Your hair looks amazing! I would suggest to definitely buy a fur (a real fur) so you will always look amazing and very warm at the same time! In other case, you can look at Elizabeth and James for great parkas! love the big faux fur hood and your purse! Amazing hood on that jacket!! REAAAAALLY LOVE YOUR PHOTOS AND PARKA!! KEEP GOING! you look stunning! love your parka, I think it looks great! Love the parka and that bag! Great outfit for winter time, love the boots! Greetings from Italy! it’s fully lined and i hope it’s gonna get me through this winter in nyc. This one is really pretty, love it! I just saw you today at NK store in Stockholm! :) Lovely. I love the parka! How much was it from zara and did you get it this season? i love the parka, i have the same problem. this winter is so cold!! 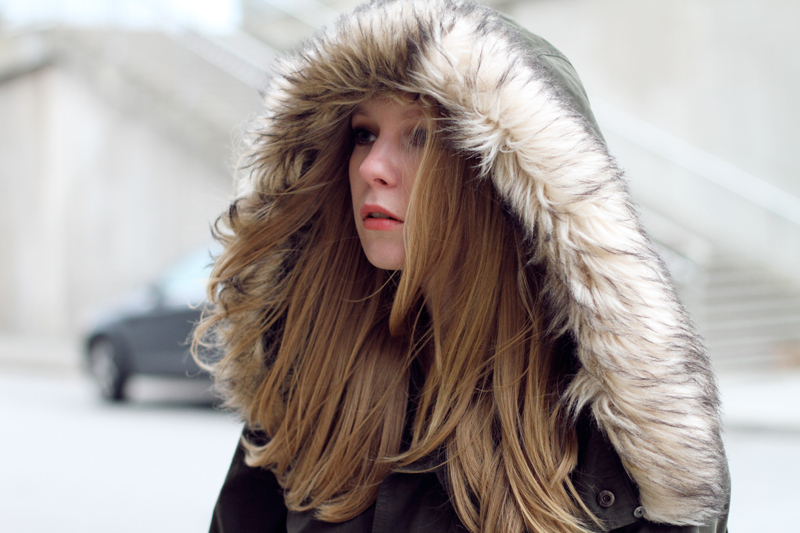 Love your parka, simply stunning! 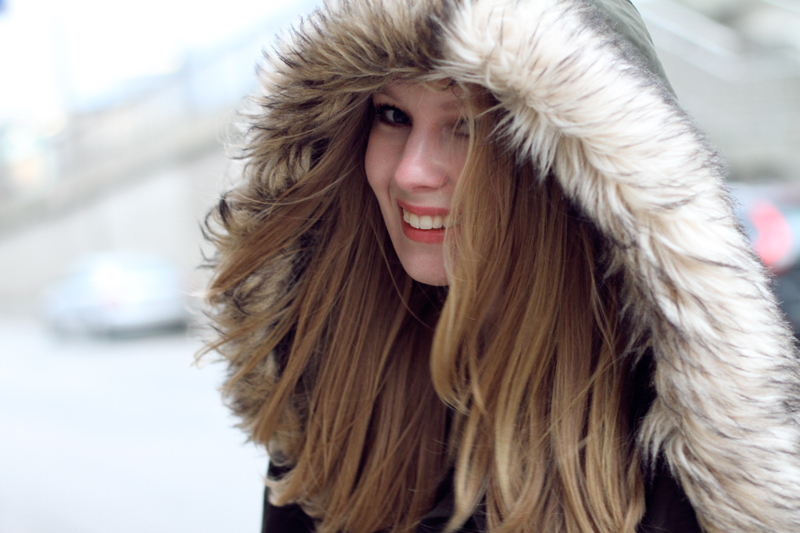 I love this fur parka jacket! You look warm and cozy! A real fur would give the whole thing a more chic touch. But the cut and length of this parka a perfect. So pretty and looks so cozy too! Great parka!!! Looks so comfy!! Check out our coats! We’ve got a nice little selection, from casual parkas to cashmere coats with cool detailing. This parka you’re wearing is beautiful, and has only one downside – it doesn’t cover the uhmm.. behind. I find it so important, because when wearing jeans/sweater and the jacket ending up in the same place as the sweater, it leaves the back less covered and at times almost bare! I LOVE YOUR HAIR!!!!! !IT IS FANTASTIC!!!! Beautifull parka! Love the proenza bag! I am personally in love with that fluffy parka. Looks super cosy. 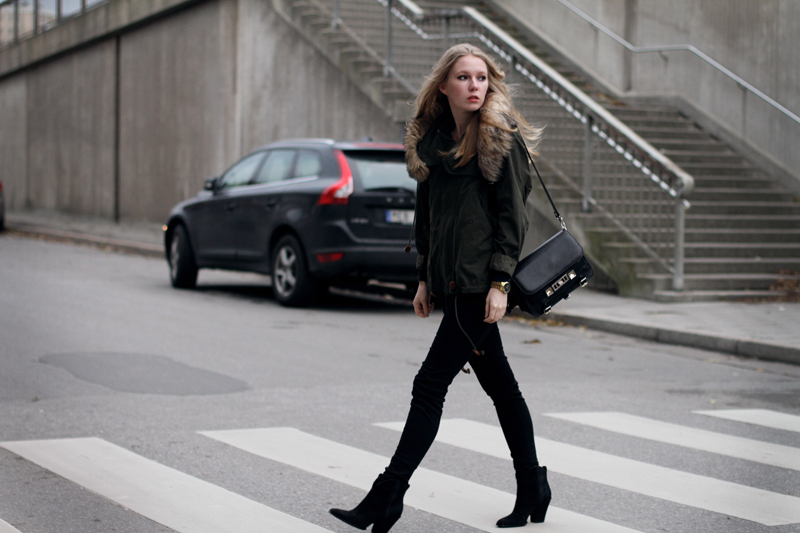 Love the parka.. this outfit is perfect for the fall! wow, just like that outfits. Usually I wear ski jackets or coats in winter. And I was looking for a new winter jacket, too. I found this one from Three Floor (http://threefloorfashion.com/index.php?page=shop.product_details&flypage=flypage_6A.tpl&product_id=587&category_id=4&option=com_virtuemart&Itemid=4). i LOVE the parka! I didn’t see it at Zara! I find that Diesel makes warm yet light weight and bute coats. The jacket looks great on you, perfect with your hair!